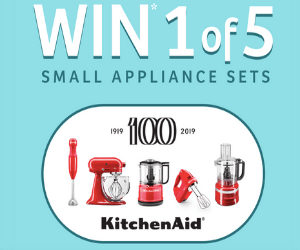 Lactantia is giving out 5 free KitchenAid prize packs full of small appliances. There are a few different ways to enter. The easiest way is to enter the PIN located on the inside of the specially-marked packs of Lactantia Butter products. You can also enter without making a purchase by sending a postage paid self-addressed envelope with an original essay of 50 words or more answering the question: “Why is Lactantia Butter my favourite brand for baking?” to: “Bake With Lactantia” Contest, PIN Code Request, PO Box 38100, 550 Eglinton Ave West, Toronto On M5N 1B0. Want to win more prizes? Check out our Contests Page.